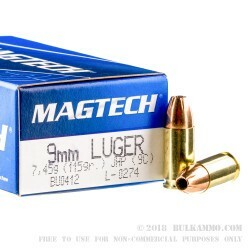 Magtech 9mm 115-grain jacketed hollow point ammunition comes in boxer-primed, noncorrosive, reloadable brass cases and is excellent ammunition for both the high-volume target shooter and anyone looking for a cheap self-defense round. 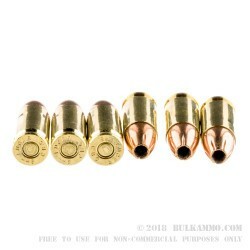 Their jacketed hollow points come with a full-length jacket that has solid expansion and penetration. 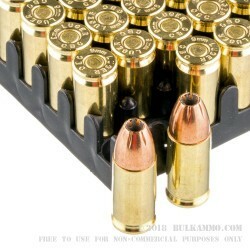 These rounds are designed to provide an accurate, reliable round in any semi-automatic weapon. 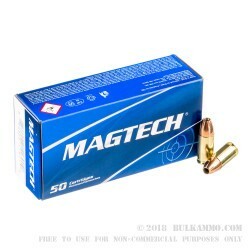 This package contains twenty 50-round boxes of Magtech 9mm 115-grain JHP. Beginning in 1926, Magtech has become an industry standard in quality ammunition for a wide variety of shooters and applications. Magtech manufactures its own components, ensuring quality control through all stages of production. All Magtech products are produced in their cutting-edge plant in Sao Paulo, Brazil and distributed to the United Stated from Minneapolis, Minnesota. Part of the CBC ammunition group, Magtech is backed by 189 years of ammunition production experience.